SAs long as music has been amplified, and perhaps long before that, it has been common for older people to dislike loud sounds. From parents telling their children to turn down the music in their bedrooms to older people who complain about the music spilling out of cars and neighboring homes, noise sensitivity does increase as we age. Of course, some of this discomfort can have to do with cultural factors, such as the style of music or sound that is being heard. Yet, even apart from these cultural influences, our ears actually become more sensitive to noise as we get older. You might ask how that can be, knowing that we also tend to lose hearing as we age. How can a person both become more sensitive to noise and also less able to hear certain sounds as time goes by? Some recent research has helped to explain these connections, pointing to exciting new results and possible solutions for noise sensitivity in older age. Donald Fucci, a Professor of Hearing and Speech Sciences at Ohio University, along with co-author Linda Petrosino, Professor of Hearing and Speech at Bowling Green State University, conducted a study to test the perception of volume among older people compared with their young counterparts. He looked at the way that individuals rate the volume of what they hear rather than simply measuring the decibel levels that are projected into space. In order to conduct the experiment, the researchers played rock music for people of different ages at different volume levels. By controlling for the actual volume level of the music, they were able to compare the reported volumes by people of different ages. In this study, they played a single song for 10 seconds—Led Zeppelin’s “Heartbreaker”—and asked participants to report their experience of loudness. Sure enough, older people tended to report that the song was louder than the younger participants in the study, holding constant the actual volume level of the song in the space. One of the explanations for this phenomenon is a common form of hearing loss called “presbycusis” – otherwise known as age-related hearing loss. 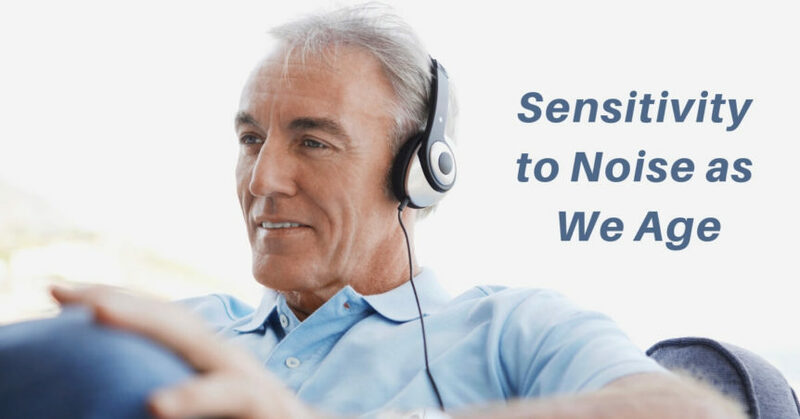 With presbycusis, people experience gradual declines in hearing while certain sounds become distorted, turning them into “noise.” An elderly person tends to lose perception of high frequencies of sound. Yet, lower frequencies, like those in the bass and drums of rock music, become magnified and distorted. This music transforms into noise for those listeners, making it appear to be louder than it might otherwise be. The distortion effect makes sound feel loud even when it is played at a lower volume. You might wonder if this study was simply capturing older people’s dislike of rock music. In order to control for that factor, the scholars only included people in the study who reported to dislike rock music. All of the participants should have been equally averse to the music itself. Yet, Fucci and Petrosino suppose that people who did not grow up listening to rock music might simply be less accustomed to consider that kind of sound to be music. Perhaps a confounding factor in the study would be that older participants automatically conflated rock music with “loudness” in a way that the younger participants, even though they also reported to dislike the genre, were less likely to do. These findings provide new evidence of the connection between age and hearing sensitivity that might help us understand the difference between hearing at high and low frequency levels. Though it is true that many older people lose the ability to hear high frequencies, even losing the ability to hear in the level of human speech in many cases, they retain the ability to hear lower tones. When these tones become distorted, they may feel noisy and may even be perceived as louder sounds than others. Perhaps this is a piece of the puzzle explaining why older people seem to be so averse to loud music, whether it comes from a place nearby or even further away. Part of the explanation might have to do with a dislike of the music or the people who are playing it, but a more generous account of the phenomenon finds that they are truly hearing something louder than their younger counterparts. Have you experienced changes in your hearing? Do certain sounds seem distorted, or do you struggle with conversation in loud settings? Neighborhood Hearing Aid Center offers comprehensive hearing tests, which help determine whether a hearing loss is present. We will work with you to find a treatment to seamlessly meet your hearing needs and improve access to sounds in your life. Contact us today to schedule an appointment!